St. Mary’s School in Oswego was being demolished and was fast becoming but a memory. Some things cross all barriers; political, social, and economic. Sometimes some things speak to you and you know you have to do the right thing, and so you do. Even in today’s world when some people’s faith comes crashing down we could not allow this Holy Family statue to come crashing down, too. The statue that had sat at its highest peak since the building’s creation in 1905, below the cross is a symbol of what is still good, honored, valued and cherished in this world. It represents years of past memories of the children who filled its halls and it symbolized the hope for a future that can be saved. We had to save it and so we did! I spoke to the foreman in charge of the St. Mary’s School demolition on site and got to the bottom of it. I asked Douglas Usyk the project manager from Ritter & Paratore Contracting Inc. out of Utica, NY, “What will happen to the Holy Family statue? And so, the search was on for a crane. Social media once again did its job efficiently and ideas were abound. The community was going to find somebody with a crane. I mentioned this to Steven Phillips, of Oswego Renaissance Association, and a text commenced. The word got through to local businessman Buddy Broadwell and he answered the call. A plan was set in motion. He stopped by the site and knew what machine was needed for this heavy-duty task. 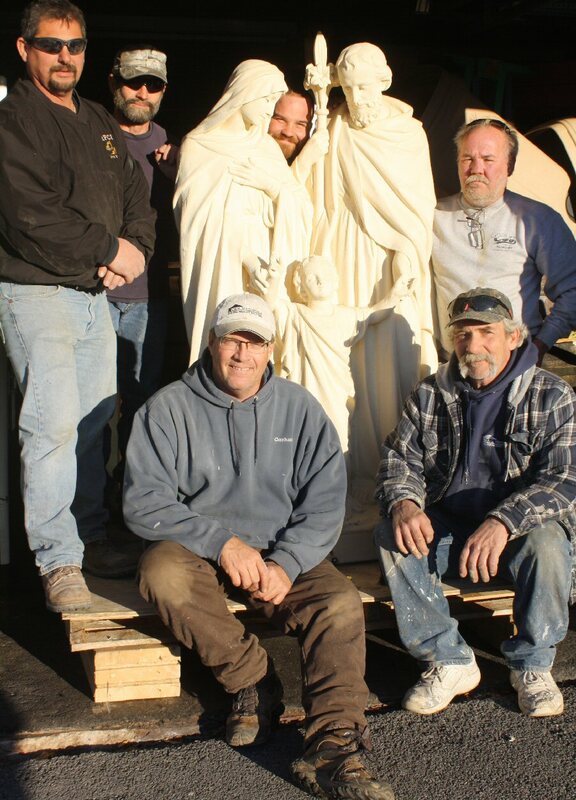 Joining forces with the Ritter & Paratore crew, Tom Dunsmoor of Dunsmoor Construction, brought his crew and equipment, a LULL heavy-duty lift crane, and salvaged the Holy Family statue. And, I knew what he meant. Father Hogan delighted in the collaboration of the community making this possible. “I am grateful to all who brought the statue of the Holy Family down from the top of the school safely. Now the statue will have a new home on our church grounds and will be enjoyed by all for many years to come,” he said. The tranquility of the image will give me strength and give me hope for my own children’s future and prosperity forever more. On this day, on this mission, I was a part of something bigger than myself. What’s next for this community? Who will answer the call? Perhaps it will be YOU! And that’s what community is all about! In a related matter: Does anyone know what happened to the two statues on the front of St. Mary’s School in Oswego, that is sadly being demolished this month??? Where exactly was this statue? Are there any pictures of the building showing the statue. We went to school there K thru 8 and neither of us remember the statue.